The Canes will take a win however they can get it, even with a little help from mother nature. This victory snapped a seven-game losing streak for Miami – the team’s longest skid since 1966. Through four innings of a Sunday matchup against North Carolina April 8, Miami dealt with the same issues that cost it the first two games of the series. But in the fifth inning, the Hurricanes delivered, rallying six runs while bringing 10 batters to the plate for a comeback 7-5 victory over the Tar Heels in a rain-shortened game. The first pitch had already been moved up one hour because of inclement weather in the forecast, and the game went into an official rain delay before play was permanently stopped after five innings. With Miami (13-18, 7-8 ACC) trailing 5-1 in the fifth inning, redshirt senior Michael Burns ripped a bases-loaded triple over the head of Tar Heels’ center fielder Brandon Riley to cut the deficit to a single point. On the next pitch, freshman catcher Isaac Quiñones plated Burns with a sacrifice fly to tie the score 5-5. Then three batters later, after freshman Dylan Cloonan doubled and freshman Tyler Paige drew a walk, fellow rookie Freddy Zamora laced a double to left field to drive in two runs to give UM the lead. Junior right-handed pitcher Andrew Cabezas (3-3) surrendered five runs in five innings. The Miami Gardens native scattered six hits and recorded four strikeouts compared to four walks. North Carolina’s Joey Lancellotti (1-3) was charged for the loss after getting tagged for four runs in the 1/3 inning pitched in relief. The Hurricanes opened the game’s scoring in the first inning off a throwing error by Tar Heels’ shortstop Ike Freeman. Senior Hunter Tackett hit a routine ground ball to Freeman, but the infielder threw over the head of Michael Busch to allow Zamora to score from third. UNC (21-11, 10-5 ACC) scored five unanswered runs, including three in the second inning on back-to-back doubles by Clemente Inclan and Brandon Martorano. Riley delivered a two-RBI single in the fifth frame to add to the Tar Heels’ tally. UM will host in-state foe University of Central Florida at 6 p.m. April 11. – Paige made his first career start for the Hurricanes. He went 1-for-1 and reached base in all three plate appearances. The hit was his first as a college player. – Miami suffered its first home series defeat to North Carolina since 2008. – If the Canes had lost, it would have been their first eight-game losing streak in program history. 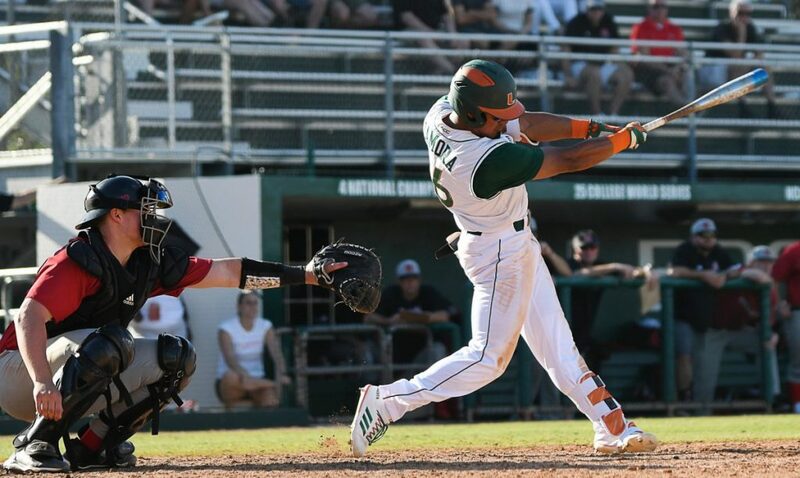 – The come-from-behind victory marks the first time this year UM has won while trailing past the fourth inning – the Hurricanes were 0-11 for that situation prior to the win. Coach Jim Morris and the baseball team had no media availability after this game.